Another heads-up on an upcoming Iowa beer event coming right up. 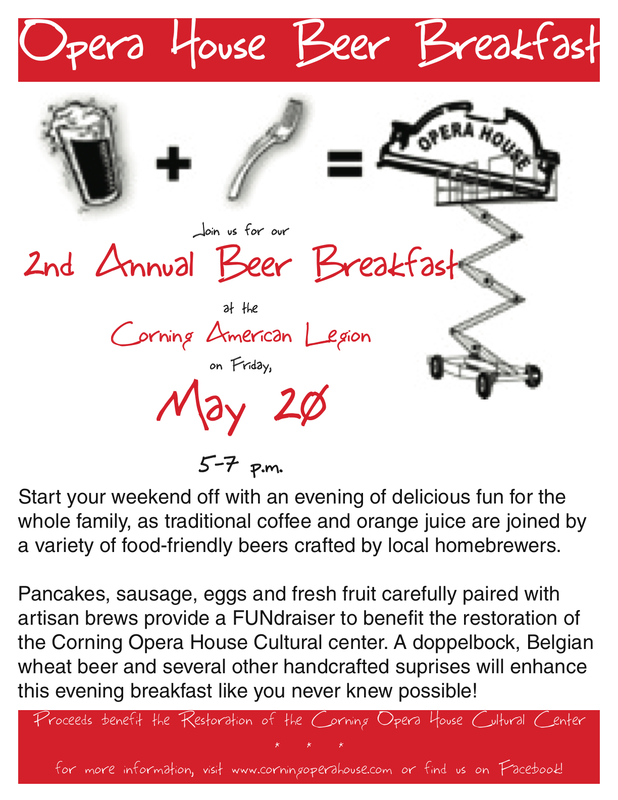 As part of my duties on the Board of the Corning Opera House Cultural Center, I worked up a beer breakfast last year–nothing like drinking beer for historic preservation–and we’ve got the sequel scheduled for May 20. This year we’ll be serving breakfast in the evening (per a few requests) and it will be taking place at the American Legion, just up the street from the Opera House on Main Street in Corning, as the final phase of renovation is under way and we can’t hold the event on our home turf. In celebration of American Craft Beer (May 16-22), the Iowa Brewers Guild is launching the First Annual Iowa Craft Beer Festival on May 21 in downtown Des Moines. There will be an onslaught of beers from over 20 of Iowa’s breweries, as well as more from regional and national breweries of note. Music, food and fun. And an afterparty. Tickets are $15 in advance and $20 at the door (which is a dealio). I’ll be there. Say hello. Back on Day 30 of the Part-time Monk project, I initiated a contest to see who might be able to guess my final gravity. Though there were two guesses of 134.5 and one guess of 134.8, that winner was Ben, who correctly guessed 135 pounds on April 7. I’ve contacted Ben, and as soon as I get his address, he’ll have a copy of Beginning Homebrew on the way to his mailbox. 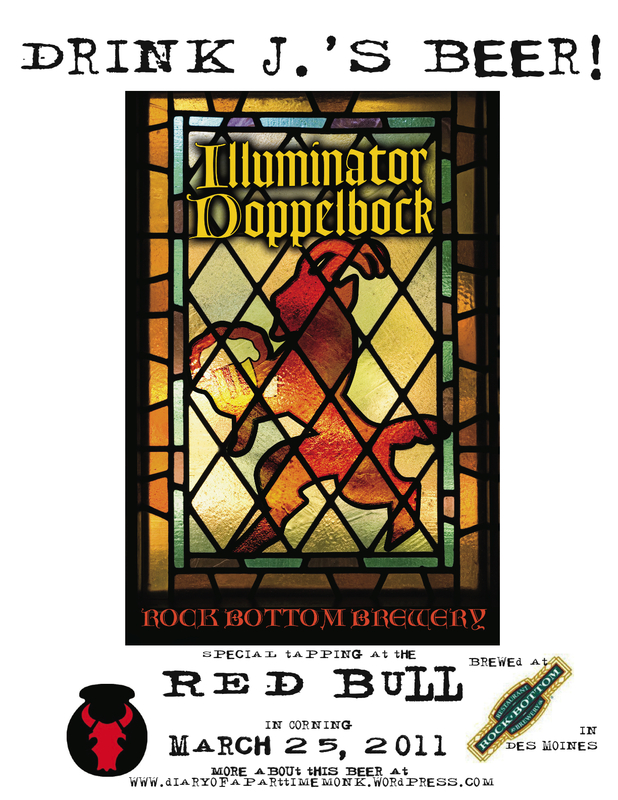 If you’re in our neck of the woods, we’ll have Illuminator Doppelbock on tap at the Red Bull in Corning on Friday, March 25. Limited quantities, so if you want to try the brewvana-Rock Bottom collaboration beer, you’ll need to hustle! 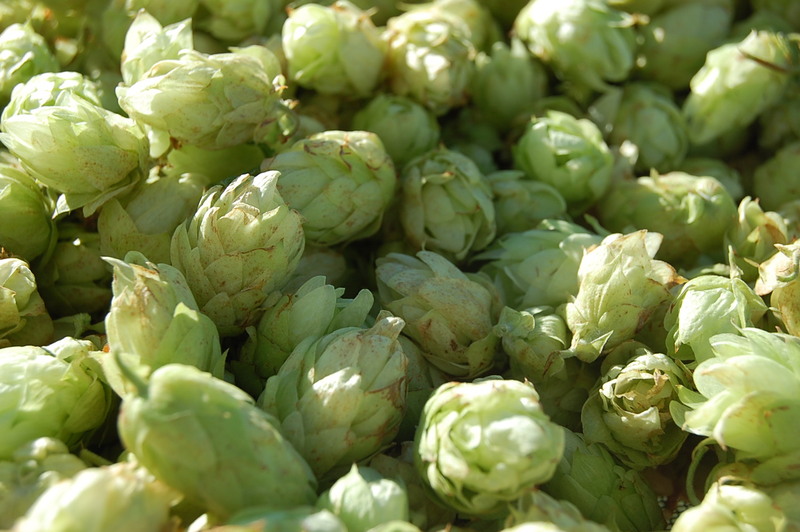 Retired from the US Air Force and looking for some noble work to do, Ray Brenner of Halifax, PA, has turned his attention to hops, working toward a commercial operation to satisfy the needs of a hop loving public. Brenner sent me a sample of Cascades a while back, so I brewed up an American brown ale to give them a test drive. The result was grapefruit-kissed libation that has served me well, whether paired with Moroccan tagine, chili dogs, ham and beans, wasabi peas or all by itself. Brenner has 150 hills and will be expanding to 500 this year, adding 10-15 varieties to see what will work best in Pennsylvania. He expects a yield of 200-300 pounds of Cascade and Magnum in the 2011 season and will happily lock in pre-orders for those interested. No website just yet, but shoot him an email at halifaxhops [AT] hotmail [DOT] com, if you’d like to learn more.